Children are one of the weakest members of society worldwide. For decades ROKPA has been committed to children and young people from poorest or most distressed circumstances. The goal is a safe and child-friendly life. This includes food, accommodation, a supporting social network and the possibility of personal development. A children's project sponsorship gives ROKPA the opportunity to invest the donations into those children's projects which are particularly dependent on support. If the situation in the project countries changes, we can react flexibly. 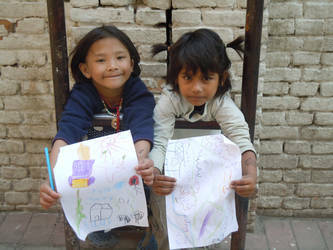 The range of ROKPA children's projects is broadly diversified. For example, ROKPA operates a Children's Home for around 60 former street children in Kathmandu/Nepal, supports over 200 children in Zimbabwe, some with a disability, and promotes about 20 children at a crèche in South Africa.